UK and US forces have continued to use depleted uranium weapons despite warnings they pose a cancer risk, a BBC investigation has found. 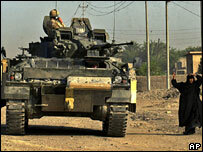 Scientists have pointed to health statistics in Iraq, where the weapons were used in the 1991 and 2003 wars. A report by the World Health Organisation (WHO) in 2001 said they posed only a small contamination risk. But a senior UN scientist said research showing how depleted uranium could cause cancer was withheld. The UK Ministry of Defence said that there was no evidence linking depleted uranium use to ill health. Depleted uranium is extremely dense and hard, and is used for armour-piercing bullets or shells. Fears over health implications led to a study by the WHO in 2001. Dr Mike Repacholi, who oversaw work on the report, told Angus Stickler of BBC Radio Four's Today programme that depleted uranium was "basically safe". "You would have to ingest a huge amount of depleted uranium dust to cause any adverse health effect," he said. But Dr Keith Baverstock, who worked on the project, said research conducted by the US Department of Defense suggested otherwise. He described a process known as genotoxicity, which begins when depleted uranium dust is inhaled. "The particles that dissolve pose a risk - part radioactive - and part from the chemical toxicity in the lung," he said. Later, he said, the material enters the body and the blood stream, potentially affecting bone marrow, the lymphatic system and the kidneys. The research was not included in the WHO report, and Dr Baverstock believes it was blocked. Mr Repacholi said the findings were not corroborated by other reports and it was not WHO policy to publish "speculative" data. He denied any pressure was brought to bear. But other senior scientists have pointed to worrying health statistics in Iraq, which show a rise in cancer and birth defects. Prof Randy Parrish of the Isotope Geosciences Laboratory in the UK said environmental and health assessments were needed in Iraq to establish the facts. Iraqi scientists trained by the UN are seeking to carry out such an assessment, but Henrik Slotte of the United Nations Environmental Programme said without clear information from the US on what was used and where, it was "like looking for a needle in a haystack". He said there was "no indication" this information was forthcoming from the US. A spokesman for the UK's Ministry of Defence, meanwhile, told the BBC that there was "no scientific or medical evidence" to link depleted uranium use to sickness in Iraq. He said the MOD was aware of recent research into the effects of depleted uranium at cellular level, but that it had to be guided by "the professional advice of the Health Protection Agency and the International Commission on Radiological Protection".